The distant future… Invaders from another world attack without warning, unleashing a new type of threat: weapons known as “machine lifeforms.” In the face of this insurmountable threat, mankind is driven from Earth and takes refuge on the Moon. 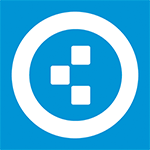 The Council of Humanity organizes a resistance of android soldiers in an effort to take back their planet. 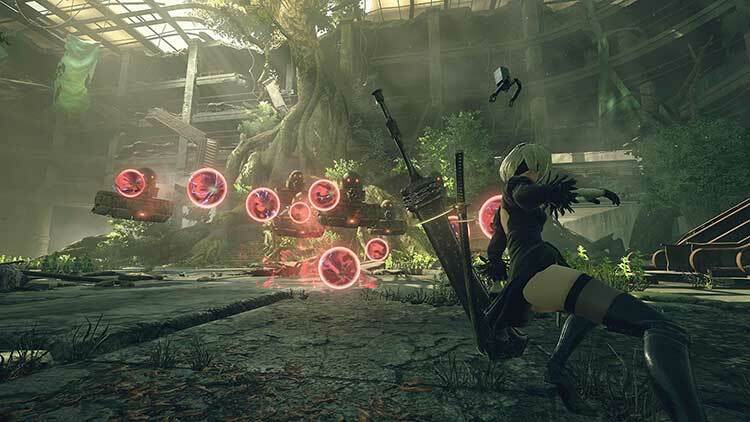 To break the deadlock, the Resistance deploys a new unit of android infantry: YoRHa . The combat mechanics click after hurdling a low learning curve, and the end result is a skillful dance where balletic dodges complement wushu-inspired aggression. Moreover, this multi-ending trip is generously peppered with surprises and revelations, as well as easter eggs that call back to the first game and the Drakengard series from which Nier spun off. 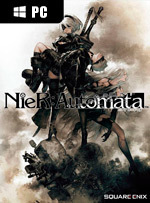 It's a meaty, often exhilarating trek that showcases Platinum Games' and Yoko Taro's unique blend of genius. NieR: Automata has more creativity and self-awareness in its little finger than most games have for their entire run time. Don’t miss this because it’s sandwiched between other, bigger games. And what a game NieR: Automata is. This is one of the best single-player RPGs to ever embrace PC, delivering a long-lasting adventure that entertains with its exciting gameplay while piercing the senses with the story it has to tell. Arriving just days after its console version, it serves as an example that the PC platform hasn't been forgotten. An exciting rush of trademark Platinum Games combat set against the background of a strange and intriguing world unlike any other. So as I sit here drinking the last of my fine lager, pondering the meaning of existence, I wholeheartedly recommend you pour yourself a glass of Nier Automata too. PlatinumGames has had many high points throughout its 11-year existence, but never has it delivered something quite as mesmerising as Nier Automata, an action-RPG to be truly savoured. 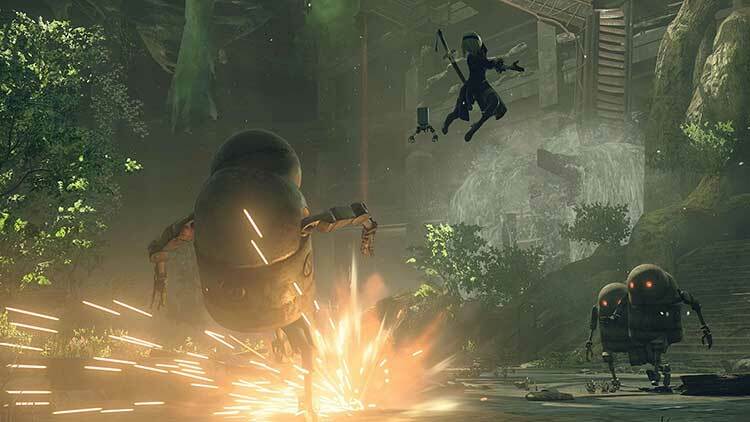 Automata is a remarkable game with an incredible amount of style, personality, and flair. Its tendency to repeat enemies, locations, and bosses can dampen your enjoyment, however, and the PC port isn’t great. Cutscenes are locked to 30fps, which make them look distractingly jerky. NieR: Automata is challenging to review, because there’s only so much I can say without adding a spoiler warning. However, I believe the best way to convey my review is to either spoil everything or force someone to watch me play it, and obviously, I’m not allowed to do either. I’d tell you to expect the unexpected, but NieR: Automata steps outside of its comfort zone too often for you to become comfortable. For a game about questioning your purpose and identity, NieR: Automata seems comfortable in its own skin. 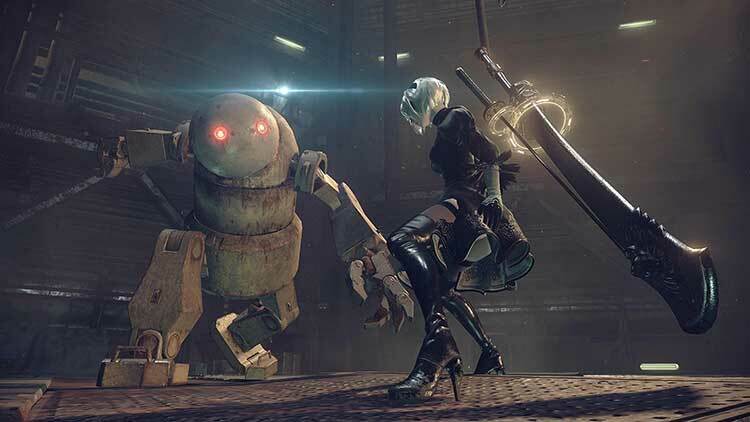 Going into NieR: Automata completely blind is, arguably, the best way to go about it, but it keeps itself firmly under wraps with a lot of intricate plot points, a killer script and plenty of interesting characters. It’s a shame the world itself feels relatively sparse, nonsensical and unpleasant to look at, but beneath the lack of environmental style is a well cared for Action-RPG that throws in enough twists and turns that leave you utterly compelled to play through it three or even four times to fully come to terms with. 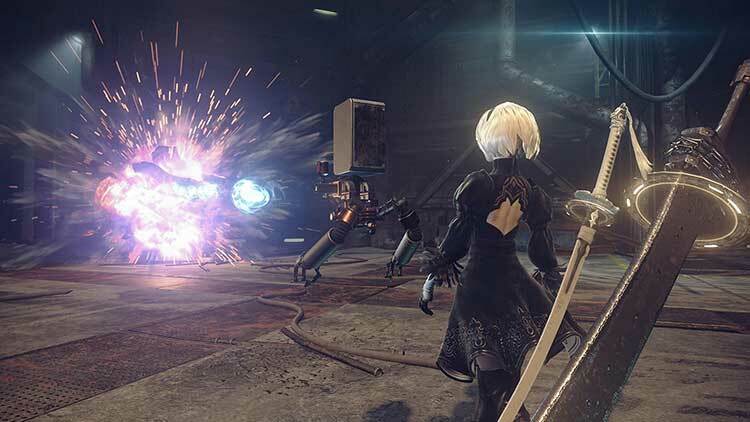 There's no other JRPG like Nier: Automata out there. It blends all sorts of genres, although not flawlessly; it looks cool and has an awesome atmosphere, despite it being a tad rough around the edges; and its plot is simply an amazing piece of sad, thinking man's sci-fi storytelling, even though it disappoints quite a lot every now and then. Yoko Taro's newest creation isn't perfectâŚ but this humble gamer is happy that it exists. No hay duda de que NieR: Automata es un gran juego, pero la versión de PC no le hace justicia y parece ser algo que se está convirtiendo en habitual cuando los juegos provienen del país del sol naciente. Davon ist nicht mehr viel übrig - obwohl es, und das muss man dazusagen, eigentlich ein erstklassiges Spiel geworden ist! Aber wenn ich's nicht einmal in meiner gewünschten Auflösung spielen kann, dann habe ich davon nicht viel. Die überempfindliche Maussteuerung, die ruckeligen Zwischensequenzen und die eingeschränkten Einstellungsmöglichkeiten tun ihr Übriges, um PClern den Spaß zu nehmen. Hier müssen dringend Patches her - dann könnte Nier: Automata sein volles Potenzial vielleicht doch noch entfalten! И если вы решите на этом остановиться, все нормально. Не страшно, если NieR: Automata запомнится вам как игра от Platinum про андроидов с этти-картинок на pixiv, симпатичных блондинов без гениталий, с жирной цитатой из «Акиры» в конце и с лучшим на свете саундтреком. 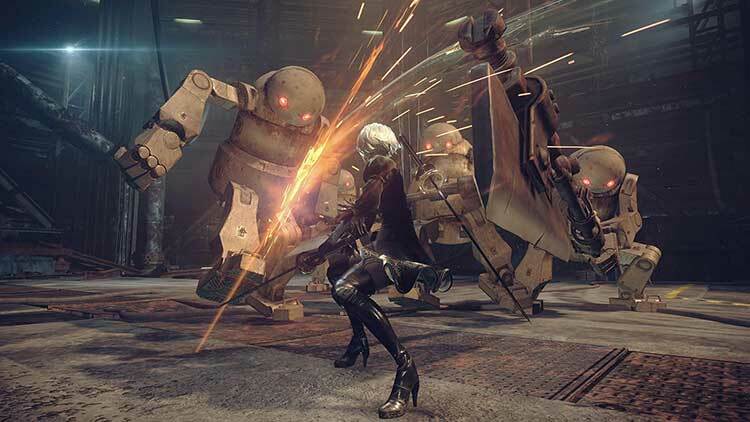 Nier: Automata'nın gerçekten çok sağlam bir potansiyele sahip olduğunu ve bu potansiyelin acı bir şekilde harcandığını söylemeliyim. Automata çok güzel bir evrene, melankolik bir havaya ve sırlarla dolu, keşfedilmeyi bekleyen bir hikayeye sahip. Ancak hikaye anlatımı açısından sınıfta kalması ve ana sona ulaşabilmek adına sizlere türlü türlü "maymunluklar" yaptırıyor olması Nier: Automata'nın birçok açıdan katlanılamaz olmasına sebep oluyor. Yoko Taro ve Platinum Games'den çok daha iyi bir iş bekliyordum.